I have tried both things in the past and even though both worked, from a weight loss perspective the HIIT (High intensity interval training) produced faster results for me than the fasting did. I just added the HIIT routine at the end of my normal workout every other day. A wonderful discussion on the connection between GMO’s, glyphosate and Celiac disease. Since the beginning of this year I have been pulling things out of my diet one at a time for a few weeks and re-introducing them to see if they were causing a problem. Unfortunately rice turned out to be one of those things that my body can not deal with. While this discovery makes me want to cry (almost all gluten free goodies have rice in them), it does explain why even after eating things that were certified gluten free I didn’t feel well. 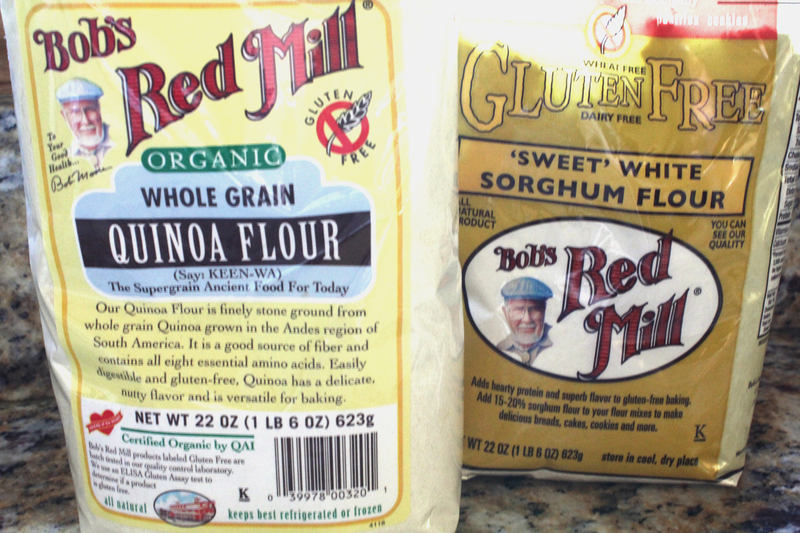 I discovered two replacements for common gluten free flours that I am going to try in my diet. I have already broken into the sorghum flour and have been using that in my recipes with no negative reaction. Quinoa flour will be tested next. I suppose this discovery just serves to make me healthier! Since we plan to be moving in the (hopefully) near future, we didn’t want to invest too much in a reverse osmosis filter for this house. 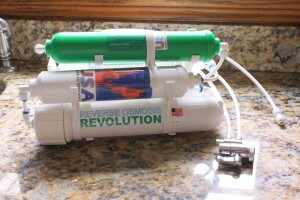 That is something we will definitely do in our new home, but for now we found a portable countertop reverse osmosis filter that we can use both in this home and wherever we are living while the new house is being built. This particular filter removes chlorine and fluoride from the water along with a variety of other nasties our city water may contain. We have it installed at our laundry sink for now and plan to keep the purified water in glass pitchers. We are very happy with this purchase so far! I found this while doing some research and found it to be quite the wake up call (no pun intended). I am not a doctor, and while I don’t agree with all of the advice in the documentary, some of what they say strikes a chord with me. It is also a reminder that even though our family has had a rough year, it is time for us all to get back to a clean diet and exercise routine. The above video is of Robyn O’ Brien at TEDx discussing the link between genetically modified foods, food allergies, and other diseases. I consider myself rather well educated in this area, but there were a few things she mentions that I wasn’t yet aware of. What a great lecture! King Corn is an interesting documentary about the over abundance of corn in the American diet and the ramifications this has had on our health. 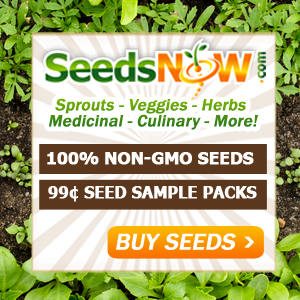 This is particularly concerning due to the large amounts of pesticides used on this majorly genetically modified crop. Two thumbs up from us at Liskabora. Jeffrey Smith and Tom Malterre, MS, CN Discuss GMOs and Gluten from Whole Life Nutrition on Vimeo. Very insightful! Infuriating as well. We need to take back control of the foods we eat, starting with growing our own. Today was the day for our new scoby to begin its life as a kombucha maker. Since I didn’t have a 1 gallon container, the little guy had to be split in two to fit into two half gallon batches. Hopefully that won’t hurt anything. I let this mixture steep for 1 hour and cool completely before removing the tea bags and ginger. It was at this point that I added the scoby and existing kombucha juice that it was living in to the two jars. I saved the ginger in the freezer to add back to the kombucha post fermentation for additional flavoring. Fermentation should take 1-2 weeks. I will post an update once we get there! 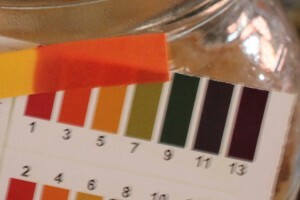 Test your Kombucha with a ph strip or meter before your first taste, it should be at a ph of 3.0 when complete. 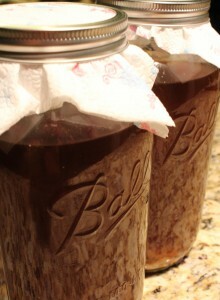 See our post on Making a Kombucha Scoby for information on how to make your own scoby from store-bought raw Kombucha.